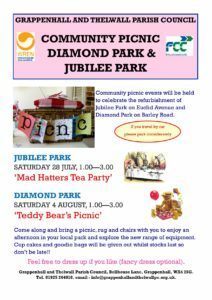 Community picnic events will be held to celebrate the refurbishment of Jubilee Park on Euclid Avenue, Grappenhall and Diamond Park on Barley Road, Thelwall. Come along and bring a picnic, rug and chairs with you to enjoy an afternoon in your local park and explore the new range of equipment. Cup cakes and goodie bags will be given out whilst stocks last so don’t be late!! Feel free to dress up if you like (fancy dress optional).